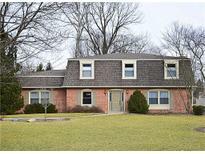 Below you can view all the homes for sale in the King Estates subdivision located in Indianapolis Indiana. Listings in King Estates are updated daily from data we receive from the Indianapolis multiple listing service. To learn more about any of these homes or to receive custom notifications when a new property is listed for sale in King Estates, give us a call at 317-900-4552. Located in Washington Township school district, close to commute anywhere in the city, Holiday Park, downtown, Butler U., all close, you will love the location. MLS#21626344. F.C. Tucker Company. Expertly renovated family Colonial home with 4-5 bedrooms,3 full baths in very convenient location of King Estates.Brand new kitchen w/center isle,new cabinets,granite tops,stainless appliances,lighting,flooring,pantry & is open to large family room w/wood burning fireplace,new flooring,new french door to large aggregate patio in large fenced back yard w/shed.New flooring in all rooms,fresh paint thru-out,refin hardwood stairs and upper hall.Hardwoods under all carpeted bedrooms upstairs.5th bedroom/Den/Office on main level next to laundry closet & full bath that could be an in-law quarters.Large Living room & dining room.Good sized Master with large walk-in closet, bath with dual sinks and shower stall.2 car att garage;gas mechanicals,newer A/C. MLS#21629493. CENTURY 21 Scheetz. A perfect place to call home. Showings start Wednesday MLS#21628311. F.C. Tucker Company. Amazing location has you minutes away from the cities BEST shopping, dining, hospitals, and Washington Township Schools. MLS#21628337. CENTURY 21 Scheetz.